According to Donetsk People’s Republic Defense Minister Eduard Basurin, speaking Saturday April 11th, the recently reported ceasefire violations by the Ukrainian government’s side are violations by the Ukrainian government’s volunteer irregular battalions, not by regular units of the armed forces of Ukraine (which are conscripts and thus represent the will of Ukrainian President Petro Poroshenko). “On Friday, the reports came that the Ukrainian 93rd separate mechanized brigade [the Ukrainan government’s forces] had demanded from the ‘Organization of Ukrainian Nationalists’ battalion [a group of nazi volunteer fighters] to abandon their positions in the area of Peski. 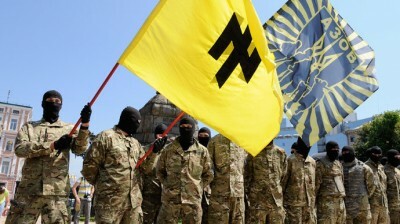 The ‘OUN’ battalion is not controlled by the Kiev authorities. This explanation by Basurin is crucially important, because it constitutes, from the ‘rebel’ side, a confirmation of good-faith follow-through by Ukrainian President Poroshenko: that he is disciplining his irregular troops who violate his commands. The original-language (Russian) report on this matter closes (as translated by me): “The Donetsk People’s Republic has repeatedly said that adherence to the truce depends entirely upon the Ukrainian side.” This repeated commitment by DPR is equivalent to their saying that if the military confrontation resumes, it will be solely because of violations from the Ukrainian government’s forces, not by those from the DPR. Also on January 21st, Harrison Koehli bannered at sott.net, “Kiev Lies to Its Own Troops, Sends Them to Be Slaughtered,” and he documented (with recent videos) that Ukraine’s Colonel Oleg Mikats, Commander of Ukraine’s 93rd Brigade, had been captured by the pro-Russian separatists during a battle at the Donetsk Airport. However, Koehli failed to note that Mikats was also one of Right Sector’s leaders, and that not only Mikats but also Yarosh himself had been in that battle, and that Yarosh’s “hand is damaged seriously” from a “close exploding shell” and so Yarosh was evacuated to a military hospital. The Ukrainian site Unian headlined, “Yarosh Wounded in Grad Attack,” and said he “has been slightly wounded from shrapnel” and was up and about. “He is fighting on.” No mention was made of Mikats. As “J. Hawk” commented at Fort Russ, on January 20th, “Mikats’ capture suggests he, a rising star in the Right Sector, tried to prove his organization would succeed where the regular military had failed. Imagine the hero’s welcome he’d have gotten in Kiev had he succeeded in retaking the Donetsk Airport.” And the fact that Yarosh himself was also there, suggests even more strongly, that Yarosh was here aiming to achieve a military victory that Poroshenko’s forces could not, which would embarrass Poroshenko by showing Ukrainians that only by means of the Right Sector’s taking charge of the Government could the war against the ‘Terrorists’ — the ‘Anti Terrorist Operation,’ or ATO — be won. Perhaps one of the reasons why Mikats had been captured was that Poroshenko’s line of command had intentionally left the Right Sector forces “to be slaughtered,” so as to prevent Yarosh from overthrowing Poroshenko. The U.S.-installed operatives were now warring against one-another, and not only against Ukraine’s pro-Russians. On January 29th, Ukraine’s Political Navigator website bannered, “Yarosh Prepares a ‘Parallel General Staff’,” and reported that Yarosh had said that “after a while, it will be implemented” — a “General Staff” of “volunteers” — to compete against and (he expected) outperform Poroshenko’s military team. Yarosh was now just waiting for Poroshenko’s regime to collapse, so that Yarosh’s own people would grab power. And then what? He would dictate terms, to Obama, and also to Ukraine’s creditors? Really? “Poroshenko is being flushed,” the Yatsenyuk bloc wasn’t. Kolomoysky was a former White House favorite; he now went his own way, to grab whatever the new chaos was making available to be grabbed. Then, on 1 February 2015, Fort Russ bannered, “We call on all commanders to rise up and start overthrowing the government,” and reported that on that day, “a Volunteer Soldier National Assembly was held, with 500 militants who had fought in the Donbass. Some wanted not just Poroshenko impeached, but also Yatsenyuk. On February 2nd, Oleg Tsarev, a leader of the anti-coup government in Donbass, whose life had been threatened by Kolomoysky, headlined “Dnepropetrovsk Concentration Camp,” and he reported that Kolomoysky was now a total dictator in the region (Dnepropetrovsk) over which Kolomoysky had been appointed governor. Four days later, Tsarev bannered “Stealing Is Not Work,” and he reported that Tsarev’s own family business, which unfortunately happened to be located in that district, had been forcefully stolen by Kolomoysky. This was the libertarian ideal: real anarchy. Only armed people held power — government was as “small” as possible. The gangsters were the ‘government,’ because there was none other. This was pure libertarianism: only natural law existed, because no man-made law existed to oppose and restrain it. Apparently, U.S. President Obama has now come down clearly on Poroshenko’s side, against even the nazis (such as Yarosh) who had carried out the coup which made Obama the master of Ukraine. In other words: Obama does not want to escalate this conflict to nuclear war with Russia. My previous view, that the ceasfire-violations on Thursday and Friday, April 9th and 10th, were consistent with U.S. President Barack Obama’s intentions in Ukraine, is wrong. I was seconding there the view by Igor Strelkov, the former commander of DNR forces, but it fortunately seems to have been wrong. And, thus, U.S. President Obama might turn out not to be the catastrophically bad U.S. President he seemed, just a day ago — worse even than George W. Bush — though Obama has brought us closer to nuclear war than any previous U.S. President has.